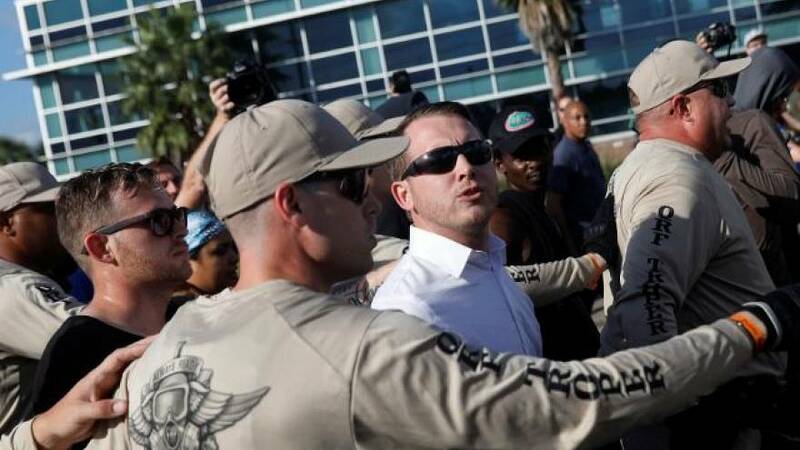 Protesters disrupted a speech by white nationalist Richard Spencer at the University of Florida on Thursday, shouting “Go home Nazis” . Spencer had helped to organise August’s white supremacist and Neo-Nazi rally in the US city of Charlottesville, Virginia, which led to a deadly-clash with counter protesters. Fearing fresh confrontation at this latest event, Florida’s governor declared a state of emergency in the area around the university in Gainesville. “I mean I respect the right to free speech, obviously because of the First Amendment, but I think it’s important to demonstrate that we don’t tolerate that type of rhetoric,” said demonstrator Haseen Alam. “We will not deal with this crap,” added fellow protester Ethan Beverley. Hundreds of police worked to separate Spencer’s supporters from demonstrators at the university which said it did not invite him to speak, but was obliged by law to allow the event. Protests were mostly peaceful but there were a few scuffles that left five people with minor injuries, the university said in a statement. The Charlottesville violence on Aug. 12 had fuelled a national debate on race, and Republican President Donald Trump came under fire for blaming both sides for the melee. The death in Charlottesville, home to the flagship campus of the University of Virginia, occurred as counter-protesters were dispersing. A 20-year-old man who is said by law enforcement to have harboured Nazi sympathies drove his car into the crowd, killing a 32-year-old woman.